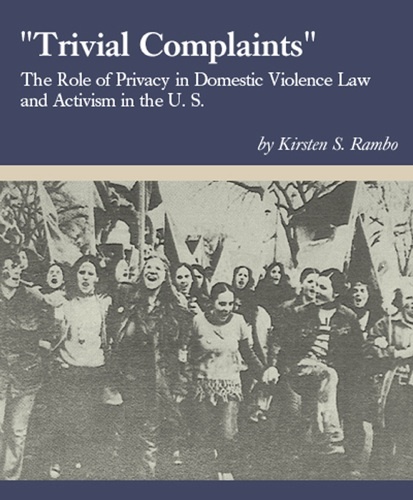 New on HEB: "Trivial Complaints"
A new entry in in HEB's Gutenberg-e series is now available, “Trivial Complaints”: The Role of Privacy in Domestic Violence Law and Activism in the U.S., by Kirsten S. Rambo. This XML-formatted title was originally published as part of the Gutenberg-e program, a digital publishing initiative of Columbia University Press and the American Historical Association that showcased the work of award-winning emerging scholars. Here Rambo explores the relationship between privacy and domestic violence through an analysis of domestic violence litigation in the United States from the late nineteenth century to the present day, taking into account how legal and cultural concepts of privacy have historically influenced the ways in which this society has understood domestic violence. The author has provided access to some of the primary source materials she drew on in her research, including links to transcripts of cases available online, as well audio excerpts of interviews she conducted with some of those directly involved. HEB recently put together an overview of usage of our resource in conjunction with collection growth and subscriber count over the last few years. The resulting chart tracks annual totals for page hits, title count, and institutional subscribers to HEB for 2007 through 2012. 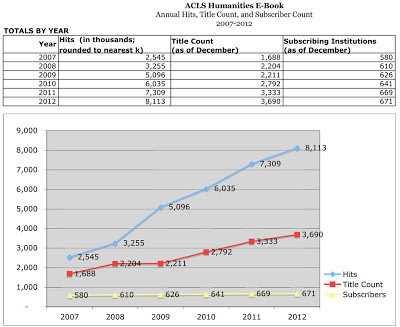 The chart shows that the number of total annual hits has increased significantly more steeply than both the number of subscribers and titles, which seems to indicate that interest and usage among existing subscribers have continued to grow over time, and that our subscribers may be getting more out of the resource the longer they have access. HEB will release an additional 330 titles this summer, which we hope will add to the overall usefulness of the collection.